Booklet printing comes in all shapes and sizes…price lists, programmes, promotional materials and information about your products and services – they all have one thing in common; they need to be perfect. So we know that when it leave your desk, you need a reliable service that can put your mind at ease and make all those hours of work worthwhile. We’ll take your artwork and help you create a masterpiece. Our booklet printing can be completed on offset or digital presses, be finished with the binding of your choice and sent off to wherever you need them. Don’t forget that we can also help you create personalised booklets that have content specific to each individual user – ask us for more information on this. We’ve created booklets for a range of industries – retail, education, travel, automotive, local authority and many more. Ask us about turning your hours of work into the masterpiece you’ve been imagining – call 0191 280 0400 or email. What we do and how we can help you and your business. Latest news and press releases from Elanders UK. 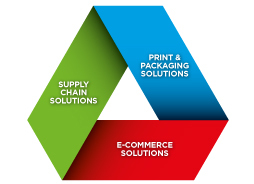 Offering supply chain, print & packaging and e-commerce services.